Kinderville® bibs feature: - an adjustable neck strap - contoured sides (making it easy for little arms to grasp food) - snap-n-catch pouch design (traps falling food and unsnaps quickly for asy clean-up - bpa, phthalate, lead and pvc-free - bacteria resistant - dishwasher safe Our good friends at NewSkool™ in San Francisco provided us with amazing custom artwork that adorns our bibs – making sure all future foodies look stylish during mealtime. Kinderville® bibs feature an adjustable neck strap, contoured sides (making it easy for little arms to grasp food), snap-n-catch pouch design (traps falling food and unsnaps quickly for, easy clean-up), bpa, phthalate, lead and pvc-free, bacteria resistant, and dishwasher safe. 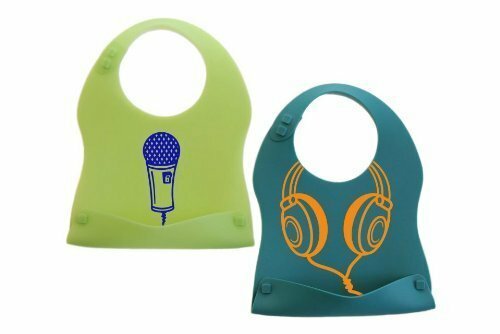 Our good friends at NewSkoolTM in San Francisco provided us with amazing custom artwork that adorns our bibs - making sure all future foodies look stylish during mealtime. </p> Sold in sets of 2 blue/green (headphones/microphone). Size is 7"wide x 10.5" tall. </p> All Kinderville products have been tested and are in compliance with current FDA, CPSIA, and State/Federal Gov't regulations. Please contact Kinderville directly for questions/comments concerning Kinderville products.